Time discredits heroes as easily as it forgets everyone else; but the saints remain. On January 30, 1948, Nathuram Vinayak Godse sprayed bullets into the frail mortal body of Mahatma Gandhi, the saint of non-violence and tolerance. Godse only managed to kill his body, for the legacy and the ideology of the half-naked fakir from India are immortal. 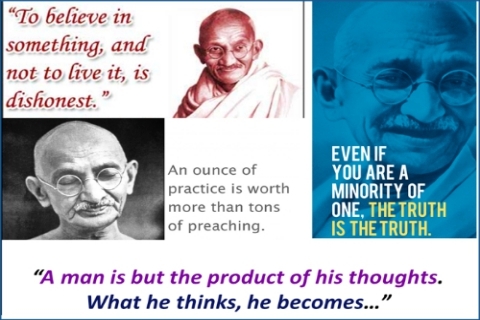 What comprises the ideology of Mahatma Gandhi? Gandhi introduced to the world the concepts of ahimsa (nonviolence) and satyagraha (peaceful civil disobedience). Gandhi did not invent nonviolence or peaceful civil disobedience. He drew on a variety of sources for his philosophy, including the Bhagavad Gita and writers such as Henry David Thoreau and Leo Tolstoy. But he was perhaps the first person in history to apply these principles to a large political movement, bringing the supposedly invincible British Empire to its knees by his success. These principles, plus his constant strivings for religious harmony, social justice and eternal truth, raised the consciousness of millions of Indians. When Gandhi went on a fast in 1947 in Calcutta to stop deadly riots in the city between Hindus and Muslims, the killings actually stopped. It was a tribute to the man who consistently stood for religious tolerance. British historian E.W.R. Lumby has called this fast “perhaps the greatest (miracle) of modern times”. Martin Luther King Jr. was among Gandhi's biggest disciples. 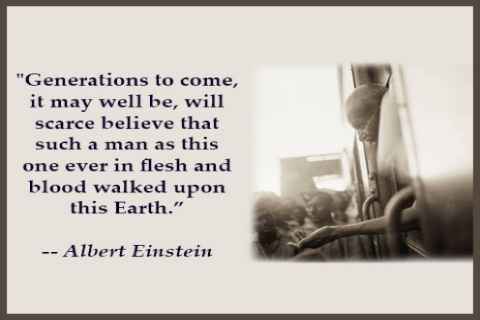 King stated that while Jesus gave him his message, Gandhi showed him the method. Why is Gandhi revered around the world? 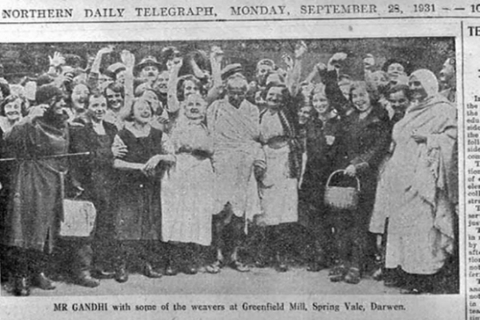 He loved people: Even as he asked for Indians to boycott British clothes, he took it upon himself to visit the mills in Manchester to apologize to the workers. In an interesting twist, the British weavers celebrated his presence, and cheered the boycott. Ideas that can move the world: Gandhi's ideas have appealed to the greatest minds of the world, including Charlie Chaplin, Bernard Shaw, Albert Einstein, Martin Luther King (Jr), Steve Jobs and Barrack Obama. Got his hands dirty: Gandhi made people manufacture salt in the coastal areas to curb British monopoly. He made them knit their own clothes. His way of protesting involved a lot of ‘doing it ourselves’. Gandhi was living out the words of Rabindranath Tagore: “to walk alone, even if nobody listens to your call.”. When, as per Gandhi, can a person follow non-violence? For Gandhi, non-violence was not a means to an end, not a technique to be followed, but a way of life. 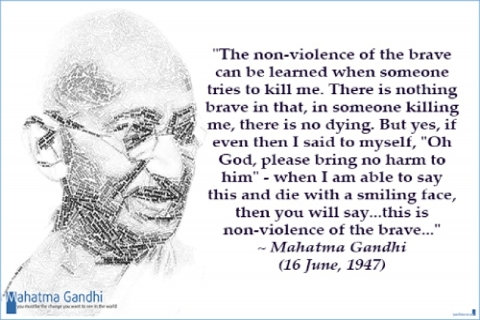 He believed that non-violence required greater courage than violence. Gandhi took the religious principle of ahimsa (doing no harm) common to Buddhism, Hinduism and Jainism and turned it into a non-violent tool for mass action. He used it to fight not only colonial rule but social evils such as racial discrimination and untouchability as well. Gandhi called it "satyagraha" which means 'truth force.' In this doctrine the aim of any non-violent conflict was to convert the opponent; to win over his mind and his heart and pursuade him to your point of view. Gandhi was firm that satyagraha was not a weapon of the weak - "Satyagraha is a weapon of the strong; it admits of no violence under any circumstance whatever; and it always insists upon truth." You will not find Gandhi in any video shot on August 15th 1947, because he was urging for peace between the religious groups in Bengal, which was seeing brutal riots. 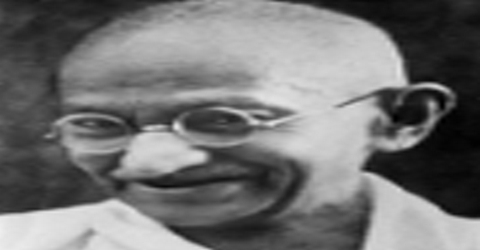 Gandhi believed in ahimsa. He practiced it too – till his death. The tragedy occurred in New Delhi as the gaunt old man walked to a prayer-meeting. In one of history's great ironies - a life-long pacifist and promoter of non-violence was struck down by an assassin's bullet. Nathuram Vinayak Godse shot Gandhi during an evening prayer ceremony at Birla House in Delhi. Prime Minister Jawaharlal Nehru announced to the world the “light has gone out of our lives”. "Just an old man in a loincloth in distant India: Yet when he died, humanity wept," a newspaper remarked on his death. 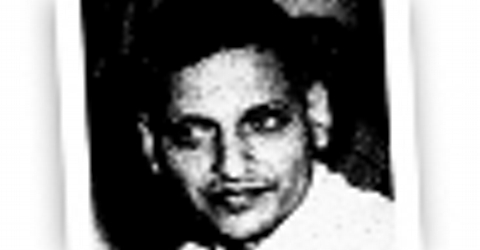 Nathuram Godse was an advocate of Hindu nationalism. He hailed from Pune, Maharashtra. He dropped out of high school to become an active member of the nationalist organizations Rashtriya Swayamsevak Sangh (RSS) and the Hindu Mahasabha and ran a nationalist newspaper called Hindu Rashtra. He plotted the assassination with Narayan Apte and six others. All eight men were convicted in the murder trial inside Red Fort by a special court, constituted by an order of the central government. After a trial that lasted over a year, Godse and co-conspirator Narayan Apte were hanged for the murder of the Father of the Nation on November 15, 1949. 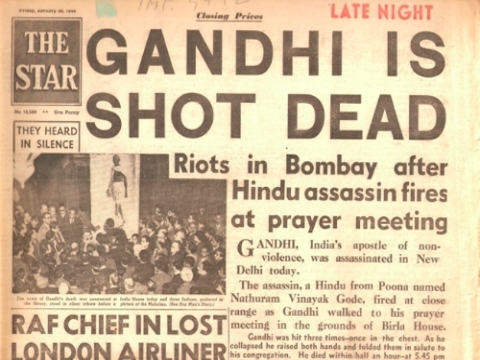 Godse rejected Gandhi's philosophy, believing Gandhi repeatedly sabotaged the interests of Hindus by using the "fasting unto death" tactic on many issues. How is it wrong to idolise Godse? Godse’s fans have created a subterranean cult that portrays him as a misunderstood patriot. But they are wrong, completely. Precisely what did Godse achieve by killing a frail old man, who was a greater Hindu than Godse could manage to be? The self-appointed advocate of Hindusim and nationalism believed that Gandhi damaged the interests of India. However, even if, only for arugments’ sake, we take his stand to be true: the damage was already done; nothing more could have happened. He killed an eighty year old unarmed man who was returning from his prayers. How could this be a “brave” act? Anyone could have killed Gandhi. Just anyone. Godse was just that – anyone. Had Gandhi lived on for a few more years, he would have implemented Nai Talim and Gram Swaraj at more places, tried his best for Hindu-Muslim unity, worked against greed based economy, prayed more, worked more. In our knowledged starved generation, where to appear a rebel is perhaps the latest cool quotient, people who only know that Gandhi was born on 2nd October, 1869 and died on 30th January, 1948 claim to be an expert on Gadhianism.